2 lessons today on adding charges, sending invoices and taking payments. They should take no more than 10 minutes each to learn. Whether you are taking a deposit for a project that is about to happen or adding a charge for a job that has already taken place, this next section is about how to do just that in Flobot. On the left hand navigation menu you will see a tab marked 'Charges'. Clicking it brings you to the screen above. Navigate to the right hand side 'cabinet' to see various options, you need to select 'Add a charge'. Flobot comes pre-loaded with various useful categories for charges. You can edit these in the settings if you want but just select the type of charge that is most appropriate for this job. You can add line-by-line item charges for parts and materials and labour etc. or you can just select 'Fixed price'. If you are registered for Sales Tax or VAT then this is automatically added for you. All the information for the invoice comes from the data collected by the system. But if you want to change some of that at the last minute, you can do that here. You will also note in the top right a selction called 'Invoice Notes'. This allows you to put a message onto the invoice, for example 'As discussed, this is the second invoice sent to you, please pay promptly.'. Once you are happy that the invoice is correct, just click 'Send Invoice' and the invoice will be emailed to your customer right away. When your customer eventually pays, you can record when and how they paid into Flobot. Once that has taken place you can close the order and move onto the next one. Have a look at the screen below. Learn how to add costs to a job to help your book-keeper. Every job incurrs costs. You can account for these costs against the individual job in Flobot - but only if you choose too. However, the more information you put into Flobot the more accurate the reports will be at the end of the month and in the dashboard. Adding a cost is very simple in Flobot, find the 'Costs' tab on the left hand side navigation. Click it and you will see the screen above. In the cabinet on the right, select 'Add a cost'. Now simply add the amount and a description of the cost. You can also attach an image or file of the actual cost, for example a receipt. Click 'Save and Flobot now works out how much profit you have made on this order. Practice adding lots of charges, send invoices to your own email address to see what they look like and add costs to get a true picture of the profit on the job. 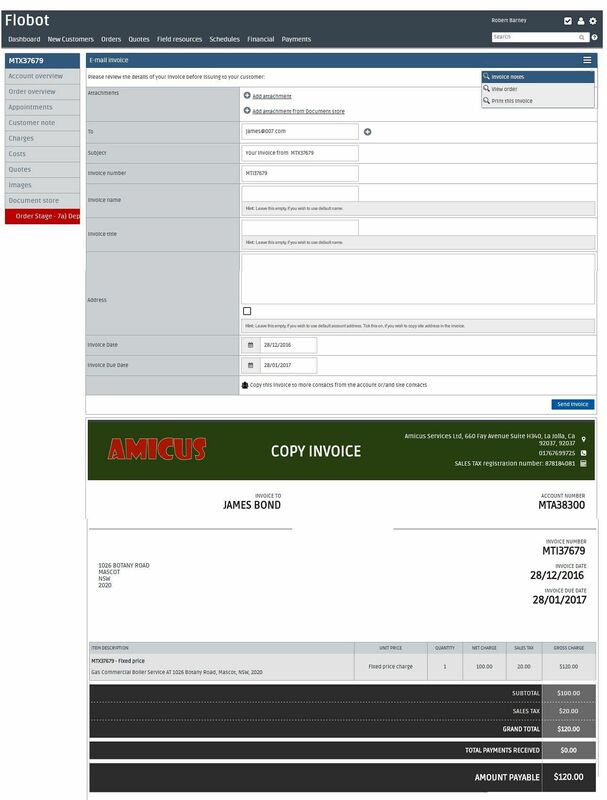 You can design your own invoices and customize them to match the brand of your company. We will cover that in the lesson on settings. Come back tomorrow for Flobot academy day four.